We had so much fun playing on your pianos, we mixed this footage into our new cover of Sam Smith's 'Writing on the Wall' (James Bond song). We hope you enjoy... and thank you for the pianos! Lessons still continued in the pouring rain! Singing outside, under a railway bridge, surrounded by the urban noises of our City of London. What a TREAT!!! Thank you StreetPiano!!!! Alani and Tomasz perform "Jerusalem" in Jubilee Park, Canary Wharf for a quick rehearsal. Thursday we hit Portobello Green for the full version.....WESTSIIIIIIIIDE!!!!! 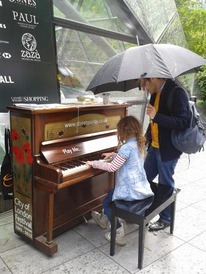 Great fun to play street piano.